George V was largely an unknown entity to both his ministers and his people at the outbreak of war in 1914. By the end of the decade he had become the most visible and accessible Sovereign in British history. He had survived the “Crash of Thrones,” as it was dubbed by Herbert Asquith that toppled his cousins: the Kaiser and the Tsar. Pioneering modern public relations he had not only established the House of Windsor in name, but in the hearts of his people; establishing a blueprint for the modern monarchy that is still followed today. In depth coverage of George V’s war work wipes out assumptions about his capability as a sovereign and his suitability for the role. It also reveals that the Sovereign took less time off than an ordinary private soldier in the years 1914-18. 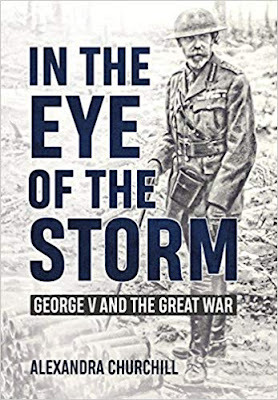 Throughout, it forms a detailed overview of life on the Home Front in the Great War through the eyes of a King; a much more balanced interpretation of a country at war than the usual focus on ﬁghting on the Western Front and those killed in battle. The image of the King and Queen Mary as distant, cold parents is debunked in full and the book also includes a wealth of new material about their youngest son, Prince John. Also reconsidered is the possibility of Nicholas II’s asylum in Britain following the Russian Revolution from George V’s point of view. To mark the 100th anniversary of the Armistice, the King’s war legacy is examined. He played a key role in the introduction of the two minute silence and the unveiling of the cenotaph. He was the chief mourner at the burial of the unknown soldier and became the ﬁrst battleﬁeld tourist when he toured the Western Front in the company of those that won the war. Battleﬁeld pilgrims today are walking in his footsteps.